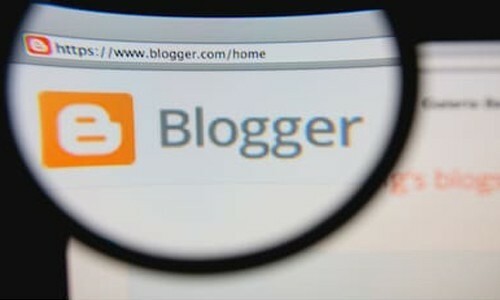 Blogger is Google’s free tool for creating your very own blog. Blogs are hosted for free by blogspot.com and your blogs URL consists of your blogs name.blogspot.com. This is not ideal for everyone, and you may wish to use your own domain name, www.mydomain.co.uk or you may want to have your new blog on a sub domain such as www.blogger.mydomain.co.uk to look more professional. Blogger lets you setup a third party URL for you blog, this lets you use your own domain name instead of the default blogger domain name. 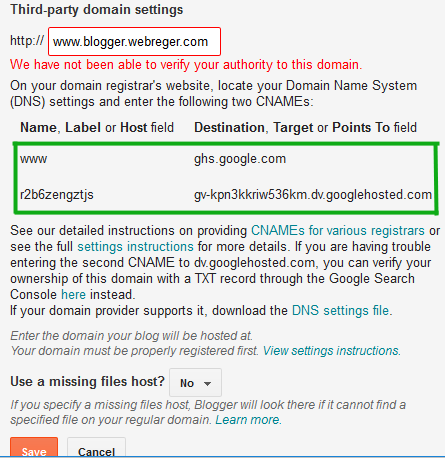 If you have a cPanel hosting account where your domain name is registered, this may be the case if you have your main website but just want to have your new blog on a sub domain; then follow these simple steps to configure your DNS settings and point your blogger blog to your own domain name. First you need to setup the domain name within your blogger account. Once you login to blogger you will need to select the blog you wish to configure. In the menu options on the left hand side click settings and then basic. Scroll down till you see the publishing section and Blog Address, here you will see your blogs domain name, click of the link + Set up a third-party URL for your blog. In order to set your own domain name you must have already purchased a domain name. In the section Third-party domain settings you need to enter the domain name that you want people to be able to find your blog on. There are two examples below, one for if you want to use your main domain and one for creating your blog on a sub domain of the domain name your own. Enter the main domain name in text field for Third-part domain name settings, such as www.mydomain.co.uk and then click on the save button. Enter the sub domain name in text field for Third-part domain name settings, such as www.blogger.mydomain.co.uk and then click on the save button. Once the page refreshes you will see a warning in red, we have not been able to verify you authority to this domain. This is ok as you need to add some CNAME records next in your cPanel account. In your cPanel account you will need to add two CNAME records. Login to cPanel and navigate to DNS Zone Editor and click + CNAME Record. For this example we are setting our new blog up on a sub domain name so our new blog will live on www.blogger.webreger.com but we have given the example settings for setting this up on a sub domain name or the main domain name. Add the CNAME Record as below, change the domain name for the domain name you are going to be using. Click Add a CNAME Record to save this new CNAME record to your DNS Zone file. The second CNAME Record you will need to add is unique to your Blogger account, make sure you copy these exactly as they are from your blogger account. In our case these are as follows. You can now go back to you blogger dashboard and click save, sometimes this may take a short while as the DNS settings aren’t being pushed out fully, this shouldn’t take more than 30 minutes and you will now see that these have been saved and the error message has gone away. Click edit next to your domain name in the blogger dashboard. You will see a little check box labelled Redirect webreger.com to www.blogger.webreger.com, make sure this is checked and click save. Now some A Records need to be added to your cPanel account. Again under DNS Zone Editor click + A Record and add the following A Records. You will now see your Blogger Blog is now active on your custom domain name, at first your blog will only show on the URL with the www. For example www.blogger.webreger.com rather than blogger.webreger.com, this is down to DNS propagation and you will just need to sit back and wait for full DNS propagation to start resolving.